Shubuta, Mississippi may not seem like a very large town, but it’s home to the largest employer for miles around: Mississippi Laminators. This family-run business has the distinction of being the only lamination mill in the state, one of only a handful in the Southeast. “There’s two in Alabama, one in Georgia, and two in Arkansas,” Owner Charles Clark explained. “We make laminated beams primarily for the residential market,” Clark explained. “We’ve been using some kind of Wagner Meters’ products with various upgrades for about 35 years,” mentions Clark. Although the Apex system has been working reliably for a long time, Mississippi Laminators will soon upgrade to a state-of-the-art Omega In-Line Moisture Measurement System which uses up to 8 sensors to check wood moisture levels 300 times per second. Data collected by its sensors can be communicated to advanced grading systems which provide additional moisture information to automated lumber grading solutions to improve the quality of wood products. Optional Omega data collection and analysis software can provide the tools to ferret out any problems in the production process, further improving the performance of a mill. “We’ve got a handheld meter we also use to spot check things throughout the plant. If you come in Monday and it rained Saturday and you’ve got no idea what got wet, the handheld can check moisture content before it goes through the planer,” he added. 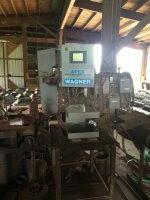 Wagner Meters has provided systems that have allowed even a small mill like Mississippi Laminators to compete successfully with much larger operations. Contact us today at (541) 291-5125 to find out how we can give you an edge as well!